The World Scout Bureau Africa Support Centre is pleased to invite entries for the inaugural Africa Scout Storytelling Contest. The contest is open to Scouts, Scout leaders and other Volunteers serving Scouting in different capacities in National Scout Organizations (NSO) within the Africa Scout Region. As much as the contest targets Africans, Scouts, Scout leaders and other Volunteers from around the world can also to submit their entries, on condition that the contents of their submission must depict African Scouts and must have either been created in Africa or at a world, regional or national Scout event. The Africa Scout Storytelling Contest 2018 will run for a 3 months, starting on the 16th of April and closing on the 22nd of June 2018. The theme of the contest is “Scouts Creating a Better Africa” and seeks to highlight the many positive actions (programmes, projects, activities, events, campaigns etc.) Scouts in Africa are undertaking to contribute to their development and the improvement of their communities. Scouts, Scout Leaders and other Volunteers from NSA/NSO outside the Africa Region that are members of WOSM; provided that their submissions depict African Scouts and must have either been created in Africa or at a world, regional or national Scout event. Stories should be of factual and verifiable activities of Scouts, Scout groups or National Scout Organizations in the Africa region. They should seek to not only inform the audience of the impactful work of the Scouts but also seek to inspire others into action. Provide evidence, share photos and make your stories really interesting. The stories should be not more than 800 words. Photographs submitted must be high resolution (300ppi and above) and in digital format only. No printed and low quality photographs will be considered as the winning entries will be used in regional and global publications. A maximum of eight (8) photos can be submitted for each category. • Indicate whether the photograph is in its original form or has been digitally manipulated. Real life action videos, motion graphics and visual animations of Scouts taking part in community projects, Scout and non Scout events or other activities that help to promote the cause of Scouting. The videos must address any or several of the thematic areas of the contest and should not be more than three minutes (180 seconds). Comics, drawing and sketches of Scout-like characters engaging in activities related to any or several of the thematic areas of the contest. Entries in this category must be submitted in not less than A4 size paper and not greater than A2 size paper and not more than eight (8) pages. The poems and spoken word can be in written form, audio narrations or video recorded and should relate to any or several of the thematic areas of the contest. The written poems should not be longer than one A4 size page, while the audio or video narrations must not exceed 5 minutes (300 seconds). easily understand what you are talking about. it the first time it is happening or not? hours? Does the timing have any special significance? important and why people should be concerned about it. are they? Did the community members also take part, and what role did they play? they be useful for the future? How did this project, event or activity benefit the following groups of people? How does this project, event or activity contribute toward achieving the vision and mission of the movement? How do you intend to sustain and/or replicate this project, event or activity? Provide online links to other relevant publications, photographs or videos about the story. Avoid acronyms and Scout jargon. Imagine you’re telling your non-Scout neighbor, friend or family member the story. Entries must show diversity in terms of gender, age, religion, race etc. Content should depict Scouts from Africa taking part in activities within Africa or African Scouts at a world, regional or national Scout event. Entries must include the names of the person/NSO submitting the entry, their country, phone number and email address and the date of submission. By submitting the entries, participants give the World Organization of the Scout Movement and the World Scout Bureau the copyright to use their entries for the promotion of Scouting. Credit for the participants shall however to acknowledged. All entries in all categories shall not be returned. 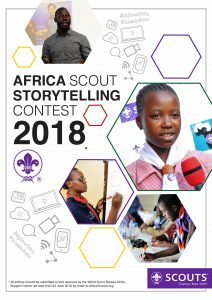 All entries should be submitted to and received by the World Scout Bureau Africa Support Centre no later than 22 June 2018 by email to africa@scout.org with “Africa Scout Storytelling Contest 2018 – Category of Submission – YourName – Country” as the title of the email completed entries submission form. South African entries also need to be cc-ed to pr@scouts.org.za. Due to the high number of entries we may not be able to acknowledge receipt of all entries. NOTE: Winning entries will be required to submit the raw files after the announcement of winners. An international panel of judges has been identified for each of the categories. They comprise of staff and volunteers within World Scouting and from Selected NSOs who have extensive knowledge and experience in the different areas. In making their decisions, judges will be guided by rules of the competition and the Scout Law and Promise. The identities of the judges will not be revealed any time within the duration of the contest. 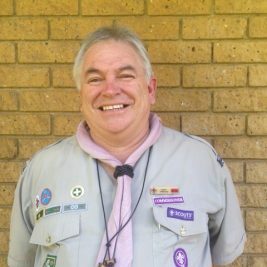 plaque and appointment as Regional Scout Brand Ambassador.